We are inviting people to take part in the Public Consultation and when they answer Question 2 on the boundaries support ‘Boundary option I’ (the top box). These boundaries are defined as OPTION I in the Second Stage Public Consultation. We believe that the existence of a town council is what matters most and the proposal should not be put at risk by disagreements about the precise position of the eastern boundary. We want as many people to say YES to a town council as possible and support the boundaries of Option I.
LBTH have confirmed that any proposal to create a parish will mean it is called ‘Spitalfields & Banglatown’, it will not include the Bishopsgate Goods Yard and it will include the whole Chicksand Estate (streets east of Brick Lane). We think the boundaries of ‘Option I’ (consisting of Area A, B and C on the LBTH map) most closely reflect the busy area around Brick Lane and Commercial Street which we all know as Spitalfields & Banglatown. A parish/town council dedicated to this area would focus on its unique needs; the pressure caused by high numbers of visitors; the need to protect shops and restaurants and the heritage of its historic centre; and maintaining the blended cultural character of Spitalfields & Banglatown. The boundaries of this ‘Option I’ area are clear. The proposed southern and eastern edges along Deal Street, Greatorex Street and Old Montague Street are well chosen and can be easily defined by local people. They do not encroach into Whitechapel - which has a different character and a set of needs of its own. This area is quite small. To walk from one end of our town to the other takes only ten minutes. There are about 8,000 people living in this area. This is an area small enough for independent candidates to organise effective campaigns on issues concerning local people. Town councillors would understand the nitty-gritty of the area they represented and have the time to be able to help do something about it. The existing borough councillors would continue to do what they do, but they would be assisted by town councillors. Our communities would have real advocates representing their views about local issues affecting them. There are many people who would like to help their community and getting elected to the town council would enable them to do this. Another benefit about town councillors is that they do not need to live in the town to be elected to represent it. In addition to residents, anyone who owns property in the town or who has worked in it for at least a year has the right to stand for election to the town council. This would mean the owners of shops and restaurants would have the opportunity to stand for election and represent the interests of their fellows in the business community. Giving us a town council would make local government genuinely local. It would be localism in action. A new town council for our little town would revitalise local society by breaking the partisan stranglehold over local politics. It would build bridges between communities as people came together, free from political interference, in a shared endeavour to make their town a better place to live, work and visit for everyone. The boundaries which we think are best for delivering efficient local government and will unite the community that live here are those of Option I (Area A, B and C on the LBTH map). These are similar to those of the existing Spitalfields Neighbourhood Planning Area with the addition of adjoining streets in the east - known locally as the Chicksand Estate but shown on the LBTH map as “Area B”. 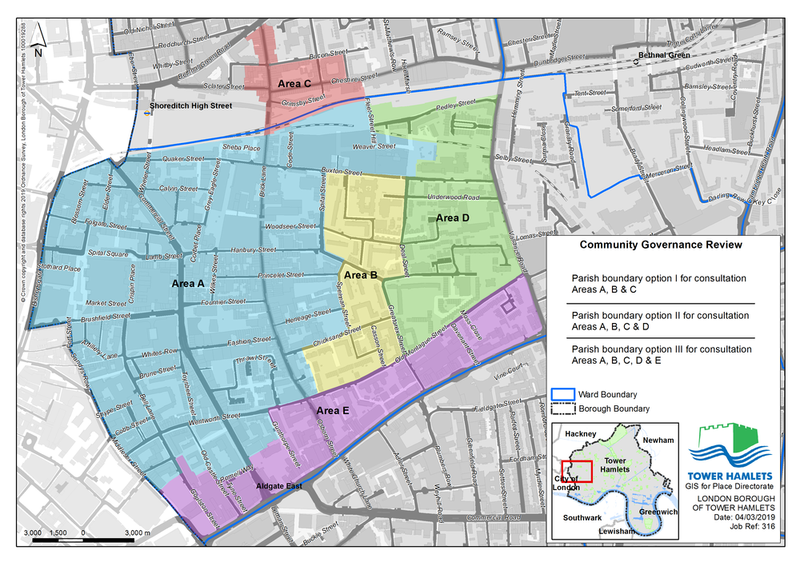 The boundaries of the Neighbourhood Planning Area (“Area A” and “Area C”) were created by the Planning Department at Tower Hamlets (in consultation with local people) during 2016 and on their own are not ideal for a parish. We welcome the eastwards extension which ensures the parish is as inclusive as possible and includes the whole community who look towards Brick Lane and Commercial Street as their local town centre. We believe this location is ideal for a town council because it contains various zones which have special planning and licensing conditions due to their proximity to central London, as well as their commercial activity and cultural value. The proposed town council area includes a portion of what is known as the ‘city fringe’ and the four historic ‘conservation areas’ around Elder Street, Wentworth Street, Artillery Lane and Fournier Street. It also includes the ‘Brick Lane Town Centre’. The people living in Area D beside Valance Road live beyond the ‘town centre’ of Spitalfields and Banglatown and are not as affected by the various pressures caused by millions of daytime and night-time shoppers and tourists. Arguably, this area is part of Whitechapel as people living here typically use shops on Whitechapel Road and transport hubs like Whitechapel Station. Similarly, the area called Area E is the north side of Whitechapel High Street and Whitechapel Road. Very few people live in this area as it is mostly offices. We do not think adding one side of the A11 is a sensible idea just because the A11 is a straight line. Whitechapel Road and Valance Road are clearly in Whitechapel and the particular needs those roads have would detract from the purpose of a parish focused on Brick Lane and Commercial Street and the specific set of needs Spitalfields and Banglatown have. The existence of a parish/town means at least 15% of the money raised in Community Infrastructure Levy (CIL) paid by developers when they put up new buildings must be spent in the area of the new parish/town (and as directed by the democratically elected parish/town council). The other 85% will continue to go to Tower Hamlets who can continue to spend it in the way they best think fit. With a town council in place we can guarantee that a portion of the money raised by developments along the ‘City Fringe’ will be spent in Spitalfields & Banglatown by locally elected representatives of the people most affected by those development. This is an area which we know urgently needs substantial investment in new infrastructure and could support improvements to local parks, the provision of new public conveniences, better waste management solutions etc. The area we propose is recognised by town planners, licensing officials, conservation officers and the police as an area with a distinct set of local priorities. Therefore, we think it would be best served by having its own dedicated town council.